Hey Y'all! 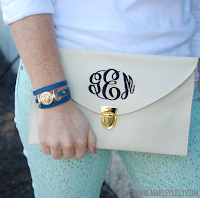 It's time for another Marley Lilly Giveaway! We love our leather bracelets so much we want to give all of our fans the opportunity to win their very own Marley Lilly monogrammed leather bracelet! You can check the item out on MarleyLilly.com by clicking the image below! Starting tomorrow, we will also be offering 40% off all Leather Bracelets plus Free Shipping on any bracelet only orders! 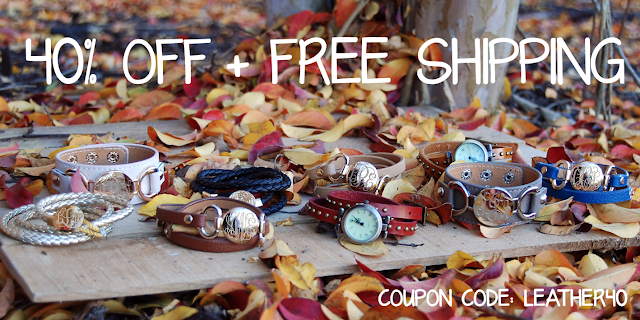 Just enter the coupon code: LEATHER40 at checkout on your purchase to receive this amazing discount! 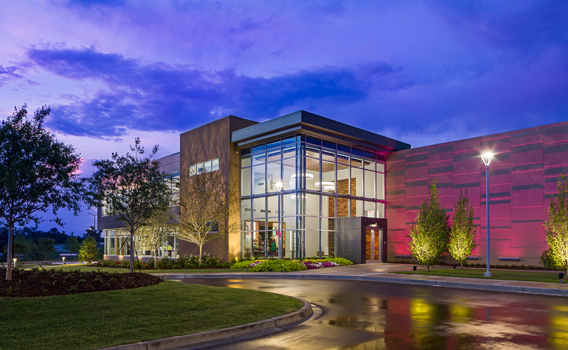 If you order additional items, the shipping costs will be calculated at checkout based on the weight of all items! Our Monogrammed Leather Cuff Bracelets are available in 11 colors! Our cuff bracelet is made of leather and measures approximately 9" x 1.125" with a 1.0625" engraved disc. 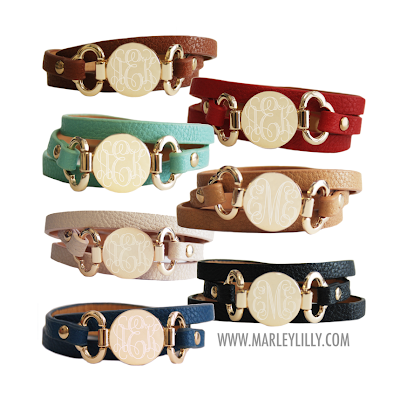 Our Monogrammed Leather Wrap Bracelets are available in 7 colors! We loved the wrap watches so much, we wanted to offer a bracelet option as well! We love the quatrefoil design on each side of the monogrammed disc! The wrap bracelet is made of leather, measures approximately 23.5" in length and features a 7/8" engraved disc. The best part about our Monogrammed Leather Cuff Bracelets and our Monogrammed Leather Wrap Bracelets is that both bracelets can be best friends with your luxe clutch! Preppy and fabulous! Both style bracelets are available exclusively available at Marley Lilly - we custom designed these! I know what you are thinking - are these bracelets made of real leather? Yes - and we can't stop smelling them! 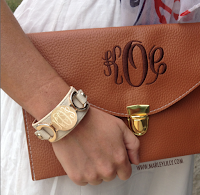 Our Monogrammed Hamptons Braided Leather Wrap Bracelets are available in 3 colors! 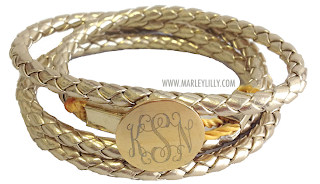 These bracelets measures about 27.5 inches long and has a German silver gold finish button that is monogrammed. The bracelet is slightly frayed at the edges where the rope meets the clamp giving it a rustic, casual look! My favorite thing about this bracelet is that it looks great all the way around. This bracelet is meant to wrap around your wrist to create a layered look! Would be a great addition to any arm party or bracelet stack! Our Leather Wrap Around Watch is available in 5 colors! This leather wrap around watch is 22 inches long and wraps around your wrist a few times for a great stacked look! The material is real leather and the watch face does move around the watch if you need to adjust it. When you receive the watch it may not be ticking, you will need to push the button on the side in to make it start ticking! This is to preserve the battery until you receive it. You may want to pop the side back out to extend the battery when you are not wearing it. We do not offer a long-term warranty on the battery. Please keep in mind this item is not monogrammed. I just ordered a bracelet and I cant wait till it comes in!! Please please do this sale again!!! I want 3 of the leather cuff bracelets!! !